About Us | United Utilities, Inc.
Our company began in 1977 as United Companies, Inc., a regulated telephone utility operating under a Certificate of Public Convenience and Necessity from the Regulatory Commission of Alaska. On January 1, 1984, the company was reorganized with United Companies as a parent corporation. Four affiliates- United Utilities, Manley Utility, United-KUC, and Unicom where structured to meet specialized needs. In June 2008, General Communication Inc. (GCI) purchased UUI, KUC, and Unicom, subsidiaries of United Companies Inc., a holding company owned by Sea Lion Corporation and Togiak Natives Limited, the Alaskan Native Village Corporations for Hooper Bay and Togiak. In May 2015, GCI and UUI acquired Yukon Telephone and Supervision from Yukon Tech, Inc.
Yukon Telephone began in 1960, when the Eller family brought telephone service to Tanana, making it one of the first villages to have local phone service. In 1980, Yukon Tel brought phone service to Ruby and in 1984 Yukon purchased the Whittier exchange. Supervision Inc. was started in 1986 and provides cable services to both Tanana and Whittier. 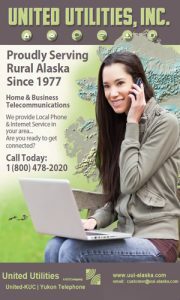 High Speed Internet service was added to Whittier in 2000, making it the second community in Alaska to have two way broadband services via cable. United Utilities has constructed and currently operates telecommunications systems in 58 communities. These systems bring United’s customers in contact with others throughout the globe through a 100% digital switching network, satellite earth stations, radio, and microwave equipment. United-KUC provides telecommunications services to three communities: Bethel, McGrath and Unalakleet. Yukon Telephone provides telecommunications services to three communities: Ruby, Tanana and Whittier. Supervision provides Cable Television and Internet services in Tanana and Whittier.